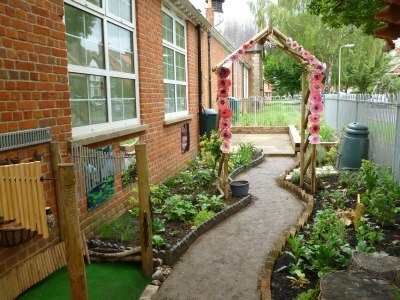 The rain kept off on Tuesday 12th June for the opening of Carswell Community School’s Sensory Garden. 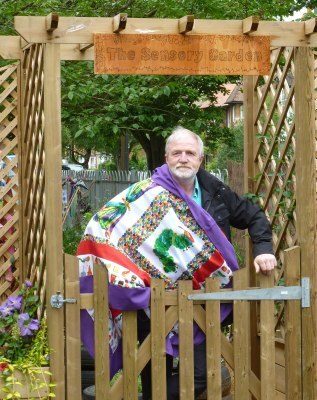 Academic, explorer, television presenter and local celebrity Dr George McGavin officially opened the garden by pulling aside a “ Very Hungry Caterpillar” curtain. 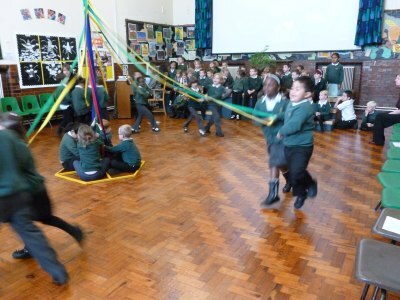 Parents toured the garden as pupils sang and performed a MayPole Dance. to a place of magical tranquillity for children and staff has brought together people from all over the community, in a project very much in keeping with the school’s title. Teams from Dalton Barracks, Abingdon Fire Station and the Princes Trust joined staff, parents and neighbours to clear the site, and local businesses contributed compost, wildflower turf, a bug hotel and hard landscaping. Nearly all the garden’s plants have been donated by well-wishers in local churches. 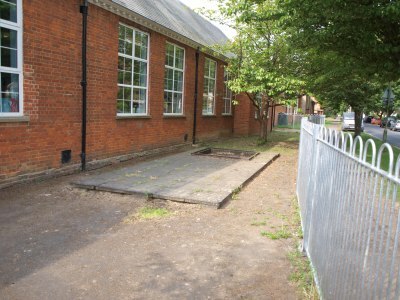 The garden will be used as an outdoor classroom by Key Stage 1 children at the school, for Science, Literacy and R.E. 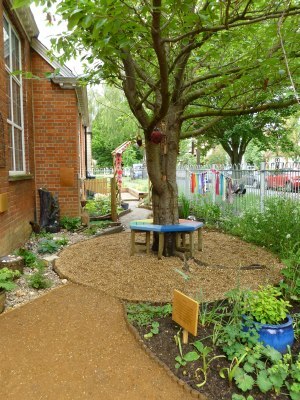 Designed by teacher Katie David and Rosemary Perrow from TrinityLearning, the garden has winding paths and a rainbow seat, leading on to a dark/light path, where children can discuss the journey of life. The children have planted bulbs and woven a willow shelter to emphasise their role in the community. Many of the school’s children have parents serving at nearby Dalton Barracks and The Forces Covenant provided a Community Award in recognition of the garden’s other role – a place of quiet and reflection for children going through difficult times. Thanks to Rosemary for update reports and this final report and pictures. What a wonderful school/community project – so many people and groups working together to create such beauty, colour and peace. Please contact us if you would like to be part of this. I watched this garden bring created from a boring patch of grass. It is wonderful. I also watched the official opening which was charming. A school that would take the time and money to create such a gem must be congratulated and held up as a fine example to others.